You are so funny… but you got that Holiday Blogging Slump and massive ennui thing just right. Maybe it just sounds like too much work? Wait, I forget, what is it we were supposed to do? Sorry, just been very tired and busy. DST has me up too early and to bed too late. 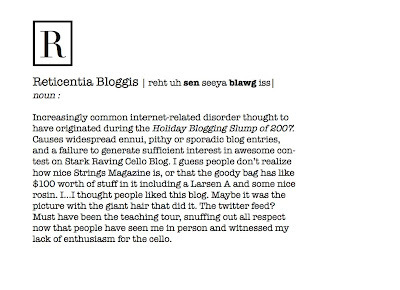 I have you listed as a blog of note and linked from my brand spankin’ new website. More traffic will come – it will darn it!